Stockport’s Best Hog Roast Company! Whether you’re catering for a large or small event, it’s essential to know that your guests will be happy and that you’ll be getting true value for money. If those are your main considerations then Hog Roast Stockport is the perfect solution for you. We have extensive experience within catering and use only the finest ingredients, meat suppliers and machinery to create our dramatic and exquisite roasts. Over the last few years, catering has changed remarkably. It was once the case that an informal affair called for a buffet whilst a more formal event would have a sit-down meal included but recently all that has changed. Many people recognise that trying to cater for everyone’s tastes during a formal meal leads to a very bland choice as you “play it safe” whilst buffets can easily be wasted as many people pick at them but still tend to go away hungry. A Hog Roast from Hog Roast Stockport is the perfect solution to both of these problems. Not only do Hog Roasts take away the formality and blandness of the traditional three course meal but with the smell of freshly cooked hog floating through the air, your guests are sure to be thrilled with the food you’ve laid on for them. What Hog Roast Stockport can do for you! 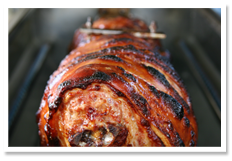 Not only can you be assured, with a Hog Roast from Hog Roast Stockport of the best possible food and service but in addition, the sight of the traditional hog roast makes a dazzling visual accompaniment your guests won’t forget in a hurry. In addition to pork, we’re also able to offer beef and lamb, as well as barbeque options for a tasty alternative whilst remaining visually stunning and out of the ordinary. To book your Hog Roast or to discuss the many options we offer, see the rest of our website or contact our friendly team today to talk about innovative modern catering which is perfect for any event of any size. Your guests will be grateful you did.